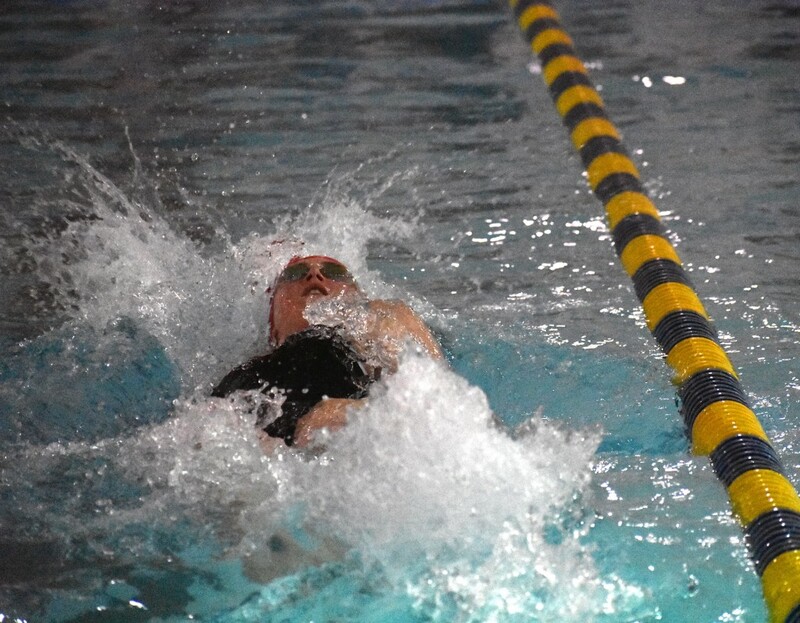 Behm won her first-ever individual state championship when she took first place in the 100-yard backstroke at the 2019 NJSIAA Meet of Champions on March 3. Cherry Hill High School East sophomore Annie Behm competes in the 100-yard backstroke during a regular season meet against Cherry Hill High School West in January. Behm took first place at the NJSIAA Meet of Champions for the first time ever on March 3, winning the 100-yard backstroke. Cherry Hill High School East swimmer Annie Behm’s career has been full of accomplishments so far. The standout sophomore has helped Cherry Hill East girls swimming to two sectional championships in her first two seasons by putting up fast times in the 100-yard backstroke, multiple freestyle events and as part of the Cougars’ relay teams. Earlier this month, Behm had her biggest individual win yet on the high school stage. Behm took first place in the 100-yard backstroke at the NJSIAA Meet of Champions on March 3 to win her first individual state title. “It’s a big rush of emotions to know all of the hard work you put in pays off,” Behm said about her reaction to winning the backstroke. Behm’s achievement comes after an outstanding freshman season where she placed fourth in the 100-yard backstroke at the 2018 Meet of Champions. With two of the three swimmers who finished in front of her last year having graduated in 2018, Behm felt she had an opportunity to contend for first place this year. In the preliminaries, Behm finished with the best time, just ahead of Mainland Regional High School sophomore Katie McClintock. In the finals, the race was tight. Behm noted she’s a faster swimmer in the latter half of the backstroke and is stronger in the 200-yard backstroke event in club meets. In the final, Behm trailed McClintock by 0.05 seconds halfway through the event. She picked up the pace in the final 50 yards, however, to win by a little more than two-tenths of a second. The backstroke was one of four finals Behm participated in at the Meet of Champions. Behm qualified for the final of the 200-yard freestyle, where she finished in sixth place and was also a part of Cherry Hill East’s 200-yard medley relay and 400-yard freestyle relay teams. Both relay teams finished in second place in their respective events. Behm said the relays were two of her favorite events from the Meet of Champions as it was an opportunity to have fun with her friends. The second-place finish in the 400-yard freestyle was also a small surprise for the Cougars after the relay team finished in fourth place in the 2018 Meet of Champions. Behm feels Cherry Hill East’s 2018–19 success wasn’t just because of the strength of the team’s top swimmers, but rather the improvement of the entire team as a whole. Behm is hoping to continue improving her times as she prepares for a number of big meets with her club team, Jersey Wahoos. She was scheduled to compete with her club team at the ISCA TYR Junior Nationals in St. Petersburg, Fla., beginning on March 26.